All the elements of southern comfort come together at The Parish. The restaurant's menu inspires patrons to explore and share unique and classic style dishes - with a twist for lunch, dinner, happy hour or Sunday brunch. The fun intimate atmosphere of this Tucson restaurant is the perfect casual dining gathering spot to enjoy a housemade infused spirit or craft beer from the full bar. The Parish is a favorite Tucson restaurant for those seeking a unique and flavorful dining experience. Dine with true Southern hospitality under glass chandeliers and in rustic table settings that ooze Southern charm. 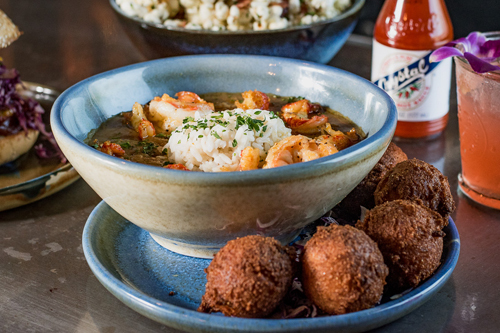 Take your tastebuds on a culinary journey with bold southern dishes like Guedry's Gumbo with crawfish hushpuppies. Indulge in original dishes like the Drunken Angel Pasta and the mouthwatering double-boned pork chop marinated in sweet tea. All dishes at The Parish pair well with the extensive selection of craft beers and unique cocktails created with housemade infused spirits. Happy hour at The Parish includes great noshes and drink specials. Looking for a true Southern hospitality dining experience in Tucson that's fun? Seek and ye shall find at The Parish. Tucson's only Southern Fusion Gastropub. Lunch, dinner, brunch, happy hour and late night restaurant menus available. At The Parish, Steve Dunn displays his true passion for genuine hospitality bringing a superior level of restaurant service with over 30 years of culinary experience that spans from New Orleans, Louisiana to right here in Tucson. Dunn is dedicated to supporting local arts, live music and is an active member and former president of the St. Patrick's Day Parade and Festival of Tucson. With a culmination of two decades of hard work in the restaurant industry, Chef Travis Peters honed his skills and has led several award-winning culinary teams. Among the many awards Peters and his team at The Parish have been awarded: Best of Tucson (Tucson Weekly); Bacon Fest; and most recently, Stella Artois Iron Chef Tucson 2017. Most recently, Peters appeared on Guy Fieri's (Guy's Grocery Games) on Food Channel and took home first place. 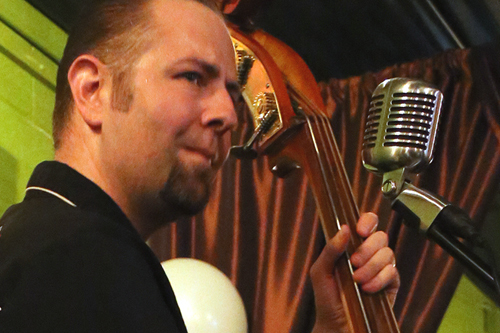 Peters attributes his creative culinary style and influences from music, his wife, Karen, and daughter, Abigail. Peters is from Tucson, Arizona. Bryce Zeagler was the owner/founder of The French Quarter in Tucson, an authentic Cajun restaurant and bayou bar for seven successful years. He’s a graduate of the University of Arizona Eller College of Management. Zeagler was born in Houston, Texas and raised in Baton Rouge, Louisiana. The Parish P.E.I. 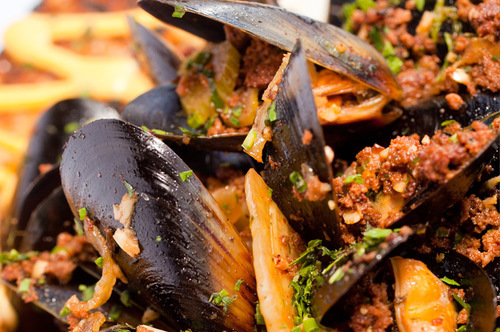 Mussels for seafood lovers! 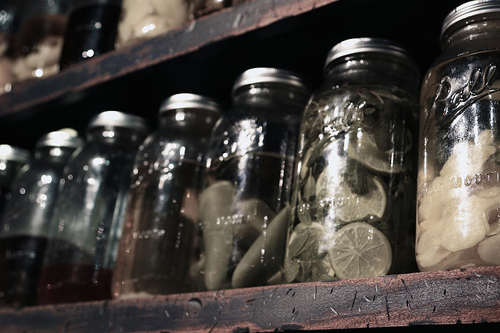 Try our famous infused spirits - a happy hour favorite!